This is a picture of the students and instructors in my intermediate level class on the last day of the CELTA program, sadly I don’t have a picture of my beginners class. The big upside of this is that all of the students are really motivated to not only learn English, but to use it as much as they can. Since everyone in the class comes from different places, they must use English if they want to communicate at all. Many of them are also motivated to learn English for their everyday lives. There are enough tourists and western expats in Bangkok that English is used by storekeepers, taxi drivers, bank tellers, etc… This means that not only will English help them professionally, but for simple tasks they can learn English instead of learning Thai – which makes sense for the refugees who don’t plan to stay in Thailand long term. The downside is that all of them also come to class with a variety of different, hard to predict problems. When I teach Korean kids, they all make exactly the same mistakes – and helping one with a grammar point or pronunciation point often helps everyone. But in this class the Somali student might be making mistakes that none of the other students have trouble with, while the southeast asians are making other mistakes and the east asians yet different mistakes. Still, the upsides way outweigh the downsides – this was the most dedicated group of language students I’ve ever seen. One of the students told us about an interesting way she likes to practice English. She heads to the busiest tourist spots in Bangkok and looks for westerners who look lost. She then gives them directions and information about the places. She doesn’t officially volunteer as a job, she just does it in her free time. One of the most impressive things I observed while staying in Thailand was the high level of spoken English. In Korea, I have students who have studied English for many years, and who can easily pass written tests with flying colors, but can’t handle even a simple conversation. 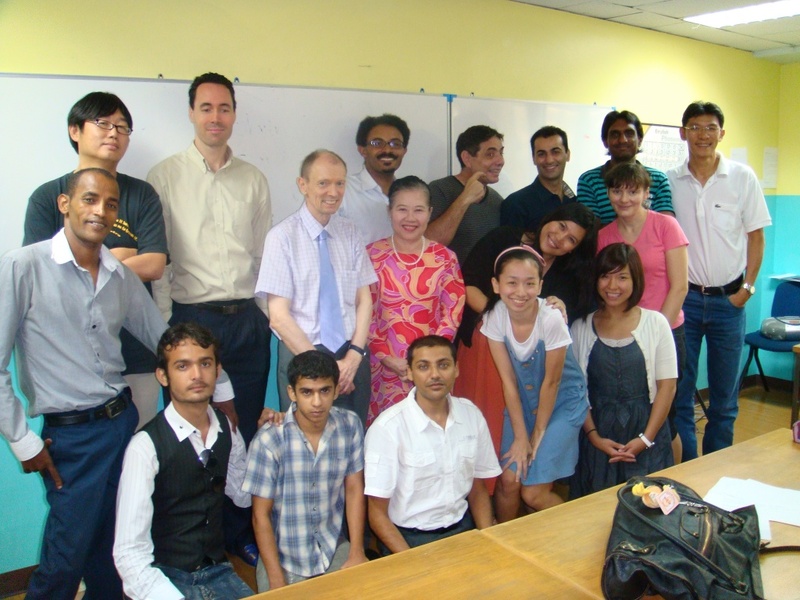 But time and again, both my students, and other English speakers I encountered in Bangkok, had impressive conversation skills without a lot of formal study. For example I was able to hold a full conversation in, albeit imperfect, English with a taxi driver for a 20 minute cab ride. At the end I asked him how he learned English, and he said he started by listening to American music (he loves Led Zeppelin for one). I talked to a bar tender who came from a poor rural part of Thailand and split her time between the bar and factory work. She had never taken an English class, I don’t even know if she knew how to read, thai or English. But she chats with her bar customers as much as possible and always memorizes a few new words each day so she can practice using them the next day. Her vocabulary wasn’t large, but she spoke very fluently using what she knew. On one hand, people in Korea are extremely shy about using English – I have a Korean friend who has studied English extensively, and when we are alone she happily talks fluently, and has a pretty good vocabulary. She even plans to enter into a graduate program in the United States. But when other Koreans are around, she clams up, or switches back to Korean. I’ve seen this with many of the students I’ve worked with – young kids don’t care, but middle school kids on up through adults have some kind of shame about speaking English. On the other hand, Thailand is a much more diverse society. 75% of the country is Thai or Lao, but 14% are Chinese and 11% are from other backgrounds – this doesn’t count the massive number of tourists from every corner of the globe that visit every year. Hearing and interacting with people who speak other languages is a part of daily life for many Thais of certain backgrounds – especially those working in tourist related industries. Compare that to Korea where 98% of the population is Korean, with most of the few foreigners being members of the military, teachers or factory workers – most of these foreigners either don’t interact with Koreans, or take the leap and learn Korean. Even though millions of Koreans spend countless hours and thousands of dollars learning English, most of them have no way to practice it outside of class – and on a day-to-day basis there is no practical reason they have to know it or use it – except when they go to college, study abroad, or get jobs with international companies. Overall, working with these students plays right into the overall goals of my teaching ‘passion project.’ I want to work with a variety of students from different backgrounds and different age groups. My experience working with these students just reinforced my feelings that it’s worth spending more time teaching. These students were so different from both the Korean children and Korean college students that I’ve worked with previously, that I am sure I can learn a lot more about teaching if I continue to search for jobs in other places and other environments. And as much as my wallet and my sense of safety are telling me to return to Korea, I will seriously consider looking for teaching jobs in other countries and other regions. China / Peru / Turkey / Saudi Arabia (just kidding, mom) – here I come! This entry was posted in Teaching and tagged CELTA, students. Bookmark the permalink. Puhleeeeeze I have enough gray hair!